My immigrant Sewall ancestor is Henry Sewall. He was baptized at St. Michael's Church, Coventry, Warwickshire, England, on April 8, 1576. His actual birth date is unknown, but could be as much as three years earlier. 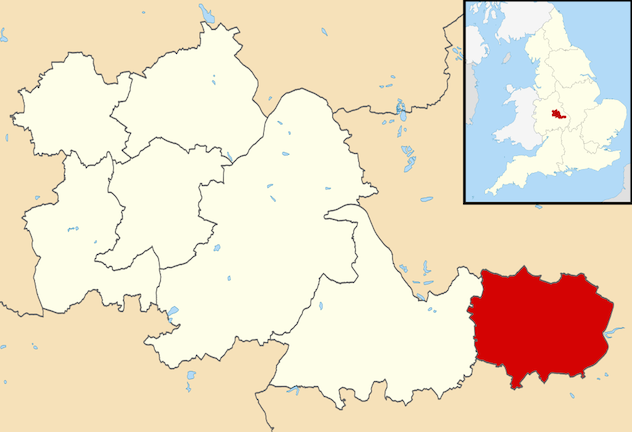 Coventry is the red area in the image at right. According to The Descendants of Henry Sewall 1576-1656, by Eben W. Graves, an invaluable source for Sewall descendants, the Sewalls were in Coventry, or at least parts of Warwickshire, for generations. What I share here is only a brief summary of the wealth of information to be found in this book, which I purchased soon after its 2007 publication by the Newbury Street Press. In 1591, Henry Sewall entered the Drapers Company of Coventry, for a nine-year apprenticeship. According to Wikipedia, the Drapers Company was a large trading guild in Coventry. A draper is an old term for one who sells cloth and dry goods. At some point between 1611 and 1615, Henry moved about 100 miles north from Coventry to Manchester, where he, his wife, and his infant son are listed in the Manchester parish records in the summer of 1615. Henry's wife was Anne Hunt, who died soon after the baptism of their son, Henry, in 1615. Not much is known about her except for the record of her burial on July 1, 1615. Within a year, Henry Sewall married Ellen (Mosley) Nugent, a young widow. They had six children, all of whom died young. The Sewall family lived in or near Manchester, England, from about 1615 to about 1631. By April 1634, Henry Sewall was back in Coventry, selling property in preparation for leaving England. In 1634, Henry Sr., about 58 years old, sent his son, Henry, Jr., about 20 years old, ahead to New England to "begin a plantation." Henry, the father, arrived in New England by July 1635, when he first appears in records in Essex County. Henry Sewall was a founder of the town of Newbury, Massachusetts, (where my early Lowell ancestors lived), which was settled in 1635. He later moved to Rowley, just south of Newbury. (See a great map of Essex County here.) Henry died, intestate, in Rowley in March 1655/6. It took a couple of years for his estate to be settled. Generation 2: Henry Sewall, the only child to survive to adulthood, was baptized at Manchester Cathedral, Lancashire, on June 25, 1615. Various records imply a birth year between 1611 and 1614. He immigrated to New England on the ship Elizabeth & Dorcas in 1634, ahead of his father and step-mother. He was sent with plenty of provisions for setting up a new home for the family. 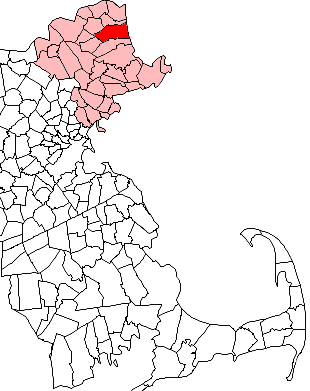 He spent his first winter in Ipswich (two towns south of Newbury in the above map), where he had received a grant of 40 acres. He sold this land in the spring of 1635 and, along with his father, became one of the first settlers of Newbury. Henry married Jane Dummer at Newbury, Massachusetts, on March 25, 1646. In late 1646, Henry and Jane returned to England with his in-laws, the Dummers, and lived in England until 1659, where he served as a minister at North Baddesley, Hampshire. Henry (the son) visited his father, Henry, in New England once, in 1650, when he bought several parcels of land in Newbury. Henry and Jane had eight children, five born in England between 1649 and 1659 (Hannah, Samuel, John, Stephen, Jane), and three born in Newbury between 1662 and 1668 (Anne, Mehitable, Dorothy). After Henry returned to New England in 1659 to finish settling his father's estate, it took him a couple of years for him to decide he would stay and he finally sent for his wife and children. They arrived in July 1661. Henry died on May 16, 1700, in Newbury, Massachusetts, and was buried in the First Parish Burying Ground there. His wife, Jane, died eight months later on January 13, 1700/01 and was also buried at First Parish Burying Ground. I descend from their oldest son, Samuel Sewall. Generation 3: Samuel Sewall was born at Bishopstoke, Hampshire, England, on March 28, 1652. He was a graduate of Harvard College with an AB degree in 1671 and an AM degree in 1674. He was first a member of the Court of Assistants from 1684-1686 and 1689-1692. Then he was named a judge of the Massachusetts Superior Court in 1692 and served as the court's chief justice from 1718 to 1728. He is most known for his involvement in the 1692 Salem witchcraft trials. He notably made a public statement of regret five years later apologizing for his actions during those trials. He has an extensive biography on Wikipedia. He also is known for his extensive diary, which gives insight into the people and lifestyles of the times. His diary is often referenced as a source for a birth, marriage, or death of Boston-area family and friends. 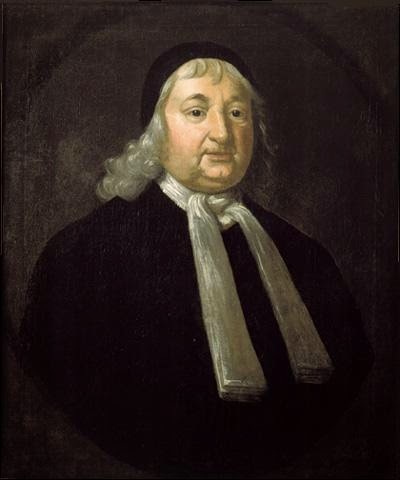 Justice Samuel Sewall married Hannah Hull on February 28, 1675/76 in Boston. They had fourteen children, all born in Boston between 1677 and 1701. (John, Samuel, Hannah, Elizabeth, Hull, Henry, Stephen, Joseph, Judith, Mary, Jane, Sarah, stillborn son, Judith). His wife, Hannah, died October 19, 1717, after which Samuel married two more times. I descend from their eighth child and sixth son Joseph. Generation 4: Joseph Sewall (1688-1769) married Elizabeth Walley. Generation 5: Samuel Sewall (1715-1771) married Elizabeth Quincy. Generation 6: Dorothy Sewall (1758-1825), married Joseph May. Generation 7: Louisa May (1792-1828), married Samuel Greeley. Generation 8: Samuel Sewall Greeley (1824-1916) married twice. His second wife was Eliza May Wells, another Sewall descendant (and the daughter of his first cousin - see below for her line). Generation 7: Elizabeth Sewall May (1798-1822), married Benjamin Willis, Jr.
Generation 8: Elizabeth Sewall Willis (1820-1900), married Thomas Goodwin Wells.